The Great Chesapeake Bay Schooner Race (GCBSR) education program brings young people living near the Bay on board schooners for a unique and exciting experience. 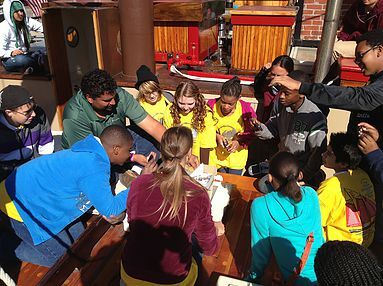 The students enjoy hands-on lessons perpetuating the mission of the race: to promote public awareness of the Chesapeake Bay’s maritime heritage and encourage the preservation and improvement of the Chesapeake’s natural resources. We entrust these students to be the stewards of the Chesapeake Bay and the schooner fleet for the next generation. An education program is conducted at both ends of the Bay. On Wednesday, students from Baltimore meet the schooners before the race. After the schooners race down the Bay, they are joined by students in Norfolk. All of the students tour some of the schooners and learn about the Chesapeake Bay, ecology and maritime history. Many of the schooners have well developed programs with professional educators that make these vessels very effective learning platforms. Although all of the vessels racing in the GCBSR are classified as schooners, their forms, functions and designs are diverse. A Baltimore Clipper Privateer, an 18th-century sailing ship, was extremely versatile on the seas. She could engage enemy ships, seize their cargo, and cross an ocean all in one voyage. A Virginia Pilot Vessel was an early 20th-century sailing ship whose purpose was to send harbor pilots out to incoming ships as they entered the Chesapeake Bay. Her primary mission was to sail as fast as possible to get her pilots onboard the incoming vessels before any other ship could. An 18th-century Chesapeake Bay Pungy Schooner was designed to be a fast sailing cargo ship. Her lower freeboard made her cargo easy to quickly load and unload, which made her adept at carrying perishables such as seafood and produce. The differences in design of these and other schooners, although subtle to the untrained eye, become very much apparent as the students learn about the work schooners once accomplished on the Chesapeake Bay. In Baltimore, the students also visit a maritime museum as part of their field trip to the waterfront. The students in Norfolk visit some maritime exhibits along the Elizabeth River. In addition to the hands-on education program, the mission of the race is further strengthened by annual donations — $177,628 to date — to the Chesapeake Bay Foundation to support its environmental education programs for children. Touring the schooners is, of course, the highlight, as the students walk the decks of sailing ships and interact with the crew and captains. They see the bunks where the crew sleeps and the galleys where chow is cooked. They get a feel of the layout of the main deck and sailing rig when they work together as crew to raise a sail. The lessons learned and the lasting impressions made on these young minds can only be gained first hand aboard these historic vessels. The GCBSR thanks the schooners who contribute to this program. Having a better understanding of the Chesapeake Bay ecology and history will enable these students to keep schooners sailing on the Bay for generations to come.